I had gone to buy some long wires at a electrician shop, when a terminal box had to be tested, he used a continuity tester. When i used to buy electrical parts in the past, they used a tester box, made of wood. This had a bulb and a tubelight starter and two long wires (230v AC). The Continuity tester would light up a 40w lamp. Now he had a LED based one, so i got one for myself. All it had, was two small cells in a plastic box with a LED, i was just flashing the LED as it looked nice thru the transparent box, it failed. The LED had burnt, the battery used. This product was not for monkeying around. Now i performed a tiny design upgrade, I used a extra-bright 3mm Red LED with a 47 ohm resistor. Now it is robust, at least for continuity. The battery life can be good only if you make quick checks. More protection may be needed to avoid damage to LED when this tester is applied across a battery by mistake. LED can flash to save battery power, one SMD – LM339 can be used for flashing and a more efficient short-leakage detector. A small oscillator with a neon may be more efficient and bright. This can also double up as a hidden Live wire or Mains AC detector. A single chip metal detector with a range of a few inches. 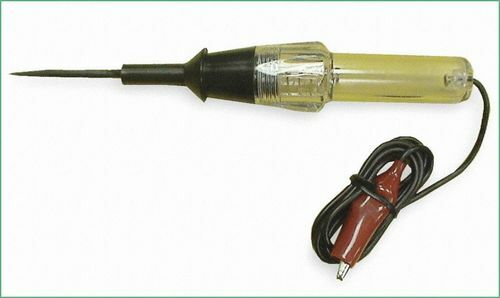 This is useful for detecting nails or screws in walls and floors, or for locating buried mains cable.